This is an important opportunity for the public to ask for increased eel conservation. indicated that the American eel stock had declined, that there were significant downward trends in multiple surveys across the coast, and that the stock was depleted. And, the 2017 assessment update repeated the 2012 finding that the American eel population is depleted. 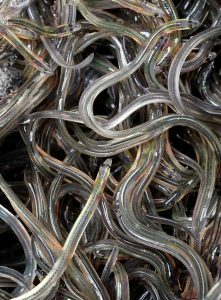 Regarding the current elver harvest, given an estimated 2,000 elvers per pound, the current Maine quota of 9,688 pounds combined with the 15 states aquaculture quota of 200 pounds each would yield a total coast wide quota of 12,688 pounds, or a potential to remove 25,376,000 eels from the water, in addition to the total yellow eels removed under the current coast wide quota of 907,671 pounds. Issue 2: Management Trigger: Option 1: Status Quo. There are also numerous allocation options in Addendum V, but the main options to maintain or increase protections for American eel are the ones noted above. The small craft warnings for west winds kept most boats at the dock this morning. The Fishermen from Atlantic Highlands sailed into good fluke fishing at first with most being keepers. Yet, when the wind increased to 25 mph the anglers had to switch to 10-ounce sinkers and could hardly hold in even shallow waters. Surf waters turned cold from the recent SW winds, and Jim Louro of Spring Lake felt fortunate to catch an 18-inch striper plus a skate on sand fleas. The NW wind should calm the surf overnight and start a trend upward in water temperature. Capt. Dave De Gennaro reports he ran out to the canyons on Sunday with his Hi-Flier from Barnegat — and found blue waters with lots of whales and dolphins. There were also trolling hook-ups, but the action was from skipjacks. Only one small bluefin tuna was caught, but it was undersized. De Gennaro said the weather looks good for another canyon attempt on Saturday. He’s sailing open then, and is doing the same for inshore fishing Friday from noon to 5 p.m. School stripers have been hitting soft plastics cast into Barnegat Inlet — occasionally including a 21-pounder such as this one held by Capt. Nick De Gennaro. The Father’s Day open trip will be from 7 a.m. to noon. R.I.P. Capt. Dom Vitolo Sr.
Just before writing this blog, I checked Facebook and found the sad information that Capt. Dom Vitolo Sr. has passed away. That former Belmar skipper was a great blackfish specialist, and a real gentleman. I’ll add news about arrangements when received. Capt. Ron Santee reported that fluking was good on his Fishermen from Atlantic Highlands when he started on the end of the flood. The first keeper turned out to be the pool winner at 4.9 pounds. Fluking really turned on with the ebb until the SE wind came up and killed it. Capt. Vinnie Vetere had to work hard again to make a good catch of stripers. He’s covered from Scotland to Stepping Stones Lighthouse recently, and his Ho-Jos have always come through on Katfish from Great Kills. Anyone wishing to try them can place an order by visiting http://www.HoJoFishing.com. The Queen Mary from Point Pleasant had a Monday afternoon charter for John D’Andrea that produced a good sea bass catch before they fished up to dark for stripers. There were some readings, and a 46-incher was jigged on a Kroc. At Belmar, the Big Mohawk reported most fares limited on sea bass today and added some ling. The Golden Eagle found the 1-to-3-pound blues for jigging before adding sea bass and a few ling to the bags. The Jamaica from Brielle got into the bite of bigger blues on Saturday, and found the biggest one I’ve heard of on a party boat so far this year — a 15 1/2-pounder by Marquise Berry. They’re sailing daily for blues, but will be running another tilefish trip on Sunday June 24 at 10 p.m. Call 732 528-5014 for reservations. The 38th annual South Jersey Shark Tournament out of South Jersey Marina in Cape May had great weather Thursday and Friday, but catches were well below their normal standards. That was no problem for Joe Zuccarelli on Gina L as Patrick Sheehan fought a 269-pound mako from the 31 Bertram. They weren’t in the biggest Calcuttas, but still ended up with $117,826. El Cid III, a 28 Mako, boated a 278-pound thresher that earned $36,434, while My Time took home $2,323 for a 249-pound thresher. One other mako didn’t qualify, and 29 were released. The blue shark money wasn’t claimed as only one short of the 200-pound minimum was brought in while 53 were released. Other releases by the 68-boat fleet included a brown, three tigers and two duskies as the cold spring waters seem to have delayed the usual shark migratory pattern. The Warriors for Warriors Charity Shark Tournament out of Hoffman’s Marina West in Brielle hasn’t posted any official results as yet, but the last leaderboard indicated that Tra Sea Ann weighed an 86-inch, 225-pound mako. Just Bill Me had a 243-pound thresher. Miss Tress was way ahead in the tuna division with a 131-pounder, and Taylor Jean was on the board with a 35-pound tuna. Despite the early morning rain, there were some fluke fishermen who braved the weather at Atlantic Highlands. Capt. Ron Santee was happy with the morning bite on the change of tide as Rich Mullenbrock limited up to a 6 7/16-pound fluke on the Fishermen. Capt. Rob Semkewyc said conditions were horrible where he had been catching with the Sea Hunter, but there were still a few limits and fluke of 5.5 and 4.7 pounds. Party boats along the Shore cancelled, but sea bass fishing has been very good for bottom fishermen who’ll be glad to get back to them tomorrow. The Golden Eagle at Belmar and Miss Belmar Princess will be looking for the 5-to-8-pound bluefish they got into last week. Those blues weren’t hitting very well Sunday after a good jig bite Saturday. The forecast for Tuesday features light southeast winds. The Surf Kings almost held their home ground at Sea Girt during a weekend afternoon surf contest with the Hudson River Fisherman’s Association and American Angler as Tim MacMahon had an 18-inch fluke before a 34 3/4-inch blue hit a clam fished by Ron Stesney of America Angler late in the afternoon. Bob Matthews reports from Fisherman’s Den in Belmar Marina that fluke are hitting in Shark River, and some big stripers are being trolled in the ocean. Ray Soyka of Lincroft put a 52-pounder on his boat. Brett Thibedeau was trolling with his father two miles off Belmar when he fought a 48-pound striper. They also caught another over 40 pounds. Matthews says clams are producing mostly short stripers in the surf. Vinny D’Anton of Wall waited for the rain to stop this morning before trying to bait stripers in the surf, but they didn’t turn on. Surfcasting for sharks at night has been catching on the last few years, and Grumpy’s Tackle in Seaside Park notes that fishing seems to be getting underway with several sand tigers reported recently. Daytime fishing was slow yesterday with only one striper and one blue weighed in. There are some fluke in the surf, with Colton Connell bringing in a 25-incher that weighed 3.55 pounds. Striper weigh-ins recently were topped by Annalee Nelson with a 39-inch, 19.20-pounder on clams in the surf — along with a 41.5-inch, 21.15-pounder the same way by John Radice. Betty & Nick’s Tackle reported big blues were in the inlet Saturday. Capt. Dave De Gennaro had no hits trolling for big stripers Friday with his Hi Flier from Barnegat, but while finishing up by casting soft plastics in Barnegat Inlet for 2-to-4-pound blues on 10-pound spin, he was surprised after the tide turned by stripers up to 12 and 21 pounds. De Gennaro will be looking for more of them, and is also taking along some shedder crabs and sandworms after getting reports of weakfish in Barnegat Bay. He also hopes to get offshore to the tuna that are edging closer — but only when the weather is right. Capt. Stan Zagleski had tough fluking conditions today with his Elaine B. II from Bahrs in Highlands, but his regulars jigged some better fish topped by a 7-pounder for Mike Schmidt of Cranford. Allen Riley and John Mazzeo from South Plainfield worked the Sandy Hook surf with bunker Thursday morning for lots of big sea robins and only one skate. John also released a 22-inch striper, and Allen hooked a 5-pound blue. Fluking conditions in Raritan Bay were tough today, but Capt. Rob Semkewyc of the Sea Hunter at Atlantic Highlands said he did much better than on Saturday as a few limits were taken. Colin Bennett (10) boated a 5-pounder to take the pool while his grandfather limited. Capt. Ron Santee said he fought wind against tide with the Fishermen and stayed later as the fishing improved. At Belmar, the Big Mohawk reported very good sea bass fishing with many limits. Jigs produced the bigger fish. The Golden Eagle even had some sea bass limits on the Saturday afternoon trip. The Queen Mary from Point Pleasant had lots of sea bass today, but Capt. Dave Riback noted that keepers are getting harder to come by. The Sunday and Monday magic hours trips were cancelled due to ocean conditions. There were no bluefish reports today. On Friday, June 8th the return of the legendary Manhattan Cup Charity Striped Bass Tournament—presented by Yamaha—was held and proved to be a huge success. After a hearty buffet breakfast at the Liberty House 28 boats departed Liberty Landing Marina for a special two column blast off, the columns honoring those who lost their lives in the Twin Towers attack on 9/11. This was the 18th time the event was held, and it is back after a two-year hiatus. The FCT Manhattan Cup included fishing teams in private boats fishing alongside boats donated for the day by the area’s top charter and light tackle guides. Its goals are to highlight the amazing fishery that exists within sight of downtown New York City, provide a great day on the water for at-risk veterans and generate funds for fisheries conservation. The event is all charity, with donations to the Fisheries Conservation Trust and toward sponsoring warriors who were assembled by our very own Robert Gil, a hero veteran of the Iraq War. He returned with physical and physiological wounds and credits the Manhattan Cup with saving his life. Today Robert is the Cups official warrior liaison and favorite son. After a full day on the water the boats returned to the docks, the teams turned in their score cards and headed inside for beverages, dinner and festivities inside Liberty House a stone’s throw away from the docks. Crescitelli reprieved his role as master of ceremonies, as raffles and the live auction got underway raising money for the charities. Celebrity angler and astronaut Bruce Melnick—two-time space shuttle veteran and a hero Coast Guard rescue helicopter pilot—address the crowd and then auctioned off autographed replicas of the Shuttles Discovery and Endeavor, which he flew. Among the many exceptional auction items was a fishing trip for six aboard Wicked Tuna multi-season winner Capt. Greg Meyers’ Fishing Frenzy out of Oregon Inlet, NC and a $1500 fly fishing outfit by Redington and Sage. Sponsors included Liberty Landing Marina, Costa del Mar, Gray Taxidermy, Yeti, D&R Boat World, Raymarine, Mojo Sportswear, Maui Jim, AllTackle.com, AFW/Hi-Seas, Pettit, Tony Maja Tackle, Tsunami Tackle, The Fisherman magazine, Princeton Tec, Interlux, the Recreational Fishing Alliance, Guides Secret Fishing Gear, Fin Chasers TV and Mustad. Thank you all for donating.